ITV's 'The X Factor' had a peak audience of 11.9 million viewers on Saturday night and 13.5 million viewers on Sunday night, down more than 1.7 million viewers from the same shows in 2010. ‘The X Factor’ results show, which saw boy band Nu Vibe kicked off the show, had an average audience of 11.35 million viewers, a 40.5% share, on ITV1 and ITV1 HD last night. An additional 275,100 watched the show on ITV1 +1. Last night’s audience compared with a peak of 15.2 million viewers, a 52% share, for the same show of 2010 and an average of 13.4 million viewers, a 47% share. Last week, the Sunday and Saturday night shows peaked at 13.5 million viewers and 12.1 million viewers respectively, down from 14.5 million and 13.8 million for the equivalent shows in 2010. Last night’s ‘Strictly Come Dancing’, the BBC’s celebrity dance competition, had an average audience of 9.50 million on BBC One and BBC One HD between 7.30pm and 8pm, a 37.3% share of the available audience. 'Downton Abbey' was watched by an average of 9.04 million viewers between 9pm and 10pm on ITV1 and ITV1 HD, a 33.8% share. An additional 280,500 watched the show on ITV1 +1. ‘The X Factor’ had an average audience of 9.60 million viewers between 7.45pm and 10pm on Saturday night, a 38.5% share. An additional 448,200 viewers watched the show on ITV1 +1. The average audience for Saturday’s show was also smaller than the same episode last year, which had an average audience of 11.95 million viewers on ITV1 and ITV1 HD, a 46% share. However, an additional average of 1.17 million viewers watched Saturday night’s show when it was repeated on Sunday afternoon across ITV1, ITV1 HD or ITV1 +1. The BBC’s ‘Strictly Come Dancing’ beat ‘The X Factor’ when both shows were on air for the second week in a row, with an audience of 9.75 million between 7.45pm and 8.15pm, compared with 8.18 million for ‘The X Factor’. Over the course of the show ‘Strictly Come Dancing’ had an average audience of 9.05 million viewers, a 39.2% share, on BBC One and BBC One HD between 6.30pm and 8.15pm. This weekend, text voting returned to ‘The X Factor’ for the first time since the text-voting controversies of 2007. 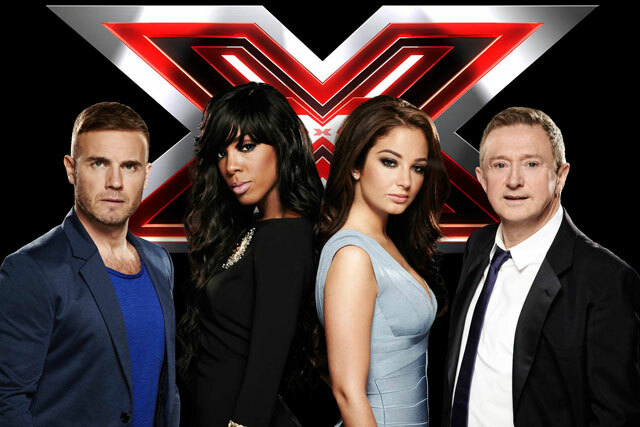 As ‘The X Factor’ is now shown over two days, this will allow an earlier closing time for text votes. Viewers can vote for their favourite contestant by sending a text with the contestant's name to the short code, starting from when the vote opens during the Saturday night show, until 12pm each Sunday. Each text will cost 35p.